With its romantic villages, breathtaking ocean views and jagged terrain, the Amalfi Coast of Italy is a perfect honeymoon destination or setting for a novel. In fact, John Steinbeck wrote about the region in his 1953 magazine article "Positano." Not exactly the ideal place for 25,000 square feet of concrete, right? Wrong. The concert venue Auditorium Oscar Niemeyer in Ravello, Italy, features a beautiful pale gray concrete terrace on which guests can mingle and stroll prior to entering the auditorium. Unveiled on Jan. 29, the auditorium is the latest brainchild of renowned Brazilian architect Oscar Niemeyer. Using materials from Italian manufacturer Ideal Work's Nuvolato line, workers from Italian flooring and paving company ITAL.PAV.I. installed the large concrete terrace, which leads into the curvaceous auditorium situated on the town's hilly, rugged shoreline. While modern architecture is a far cry from the historic look of most structures in the area, Ideal Work managing director Luca Seminati says the project's neutral coloring allows it to blend into its surroundings. "It's a concrete floor and is really simple, but it fits perfectly in that place," Seminati says. "It's a minimalist look. At first, people said a concrete floor would be crazy. We offered to the architect to do stamped concrete, but he was convinced that natural concrete was the best, and it turned out to be the best." The project's history dates back to 2000, when Niemeyer first presented the auditorium plans. One of the most famed architects in the world, the now 102-year-old Niemeyer boasts achievements that include designing the Cathedral of Brasilia and the National Congress of Brazil and winning the Pritzker Prize in 1988. Nearly 10 years passed before work on the project could begin, as Niemeyer and his project partners faced petitions and claims in court. (The project's opponents included environmentalists who believed the auditorium would disrupt the coastline's natural beauty.) "They had some major bureaucracy problems, but once the papers were signed and everything was solved, they got started," Seminati says. 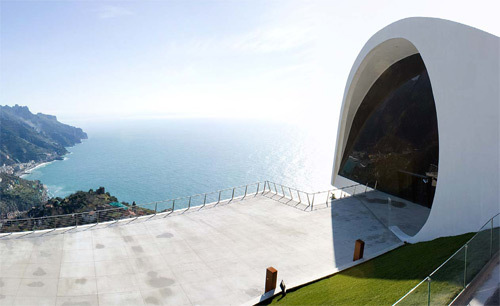 A large Italian construction company secured the job of building the structure via a public bidding process - the auditorium is owned by the town of Ravello. The concrete terrace job was then outsourced to ITAL.PAV.I. and Ideal Work, who have teamed up on jobs in the past. "(ITAL.PAV.I.) is our contractor for special projects," Seminati says. It was Niemeyer, a decorative concrete pioneer, who selected natural-looking concrete for the terrace, Seminati and ITAL.PAV.I. 's Massimo Ruggiero say. Bordered by a fence and chocolate-brown pillars, the solid color surface is tinted in light gray for a natural look. "You can see the look of the concrete," Seminati explains. "There's nothing really fake about it." Niemeyer has been known to favor reinforced concrete for its aesthetic qualities in his work, and Ruggiero says the architect felt adding additional color was not necessary. Ruggiero says Niemeyer felt color was unnecessary as the auditorium and its surroundings held enough beauty on their own. "Concrete is perfect," Ruggiero says. The fairly simple installation process was completed by ITAL.PAV.I. workers in just two weeks. First, they poured concrete approximately 6 inches thick. Then, workers applied Ideal Floor Hardener, a dry-shake hardener with titanium dioxide, in a Pewter color. They put down 90 pounds to 120 pounds per 100 square feet. Seminati says the hardener gives the floor a reflective quality and provides durability in harsh weather. "Ideal Floor dramatically improves the abrasion resistance of concrete," he says. At the new Auditorium Oscar Niemeyer in Ravello, Italy, 25,000 square feet of decorative concrete guides attendees to the main entrance (at right of photo). The contractor completed a broom finish after applying the hardener, and after seven days, the floor was finished with Ideal Hard Sodium Silicate Densifier. Seminati says this colorless, VOC-compliant product seals, densifies, hardens and waterproofs the surface in one step. It allows the floor to resist dust and other signs of wear that heavy pedestrian traffic can cause, he adds. "The main reason why they chose this product was because it doesn't change the natural look of concrete," he says. "Ideal Hard will not yellow, discolor, chip, peel or show unsightly wear patterns with use. In fact, the more an Ideal Hard floor is used and matures, the better it looks." Ruggiero says he was impressed with the products' qualities and the fact that Ideal Work staffers were involved throughout the job's duration. "The job needed a great consistency of color and a warranty for 10 years," Ruggiero says. "Ideal Work products match this expectation. The general contractor was also happy to know that Ideal Work would supervise the application of its products." The work process ran smoothly with no bumps along the way, according to Ruggiero. "The job was fine," he says. "And we enjoyed working in that spectacular place!" Seminati says the biggest challenge posed by the Auditorium Oscar Niemeyer project as a whole was creating a look that would compliment its historic, rugged surroundings. "In this area, we have old-style houses and romantic areas, and nothing that's so modern," Seminati says. "The challenge for the architect was to create something modern that could fit in this place." Maintenance of the terrace requires only a regular washing, thanks to the longevity of the chosen materials, Seminati says. "That was another request - a low-maintenance floor, which is why we used these types of materials." Just one element of the abstract-looking structure, the concrete terrace leads to the semi-oval auditorium entrance, which looks similar to the mouth of a large cave. The white building's top floor, which holds the actual auditorium space, seems to defy gravity as it hangs partially over the terrain's edge. The auditorium seats 400 and was designed to promote perfect acoustics - the building also holds a recording studio and rehearsal room. One especially unique feature is its mobile stage, which can be elevated to create space for events such as conventions. Ample window space gives spectators a complete view of the sea. Outside, an oblong plaza connects the auditorium to surrounding roads, and a parking lot allows room for 107 vehicles. The land's uneven surface posed challenges. However, Niemeyer embraced the site's texture by designing the structure to fit the earth's natural shape. Seminati says Niemeyer didn't want to build an expensive project that would require unnecessary earthmoving, so he decided to build the parterre (the seating area at the rear of the theater's main floor) exactly according to the existing slope. Ruggiero says the auditorium's impact can only be fully appreciated in person. "The way the architect includes the auditorium on the incredible Amalfi Coast, it is incredible," Ruggiero says. "You have to be here to fully understand. The best picture can only give you 20 percent of the emotion."